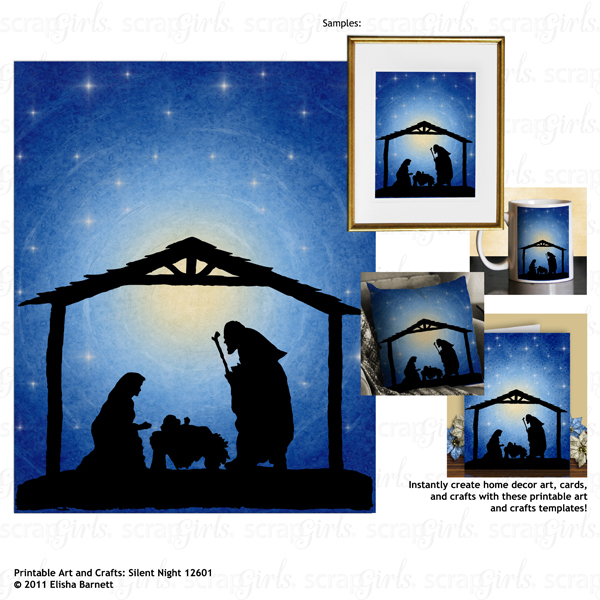 This digital scrapbooking collection is based on the timeless Christmas carol "Silent Night" which recounts a quiet night of the birth of Jesus. It has color scheme of rich blues and bright shiny gold and silver with velour, old paper and glitter textures. 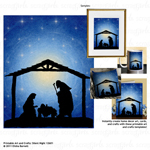 It is ideal for scrapbooking about the true the meaning of Christmas, nativity plays, or special family traditions and celebrations. 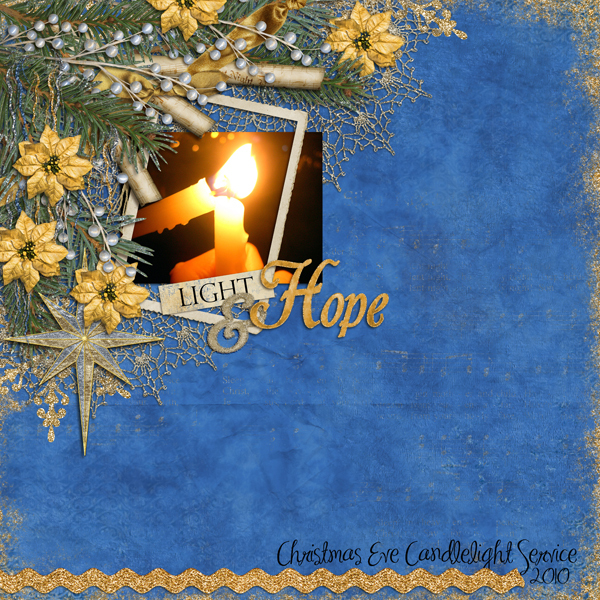 Silent Night Paper Biggie with 16 papers in blues, golds, and tans, richly textured and glittered. 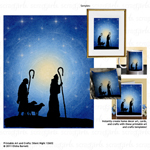 Also included are 3 transparencies featuring nativity scenes: the stable, the shepherds and the wise men. A starry night sky paper is provided as a background, but you can place these over any paper to instantly transform it to fit the theme. Silent Night Alpha - glitter edge velour letters (upper and lower case), numbers, and some symbols and punctuation. 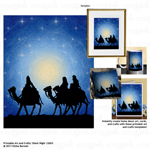 Printable Art and Crafts: Silent Night 12603 features a silhouette of the classic nativity story wise men traveling by night against a clear blue starry sky. 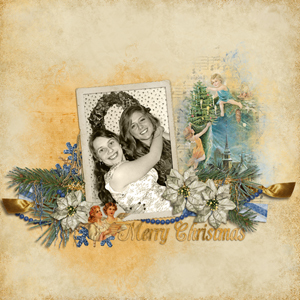 Customize this set of Christmas ornaments and decorations to match any digital scrapbook layout or hybrid craft project! Packed together to save you money! 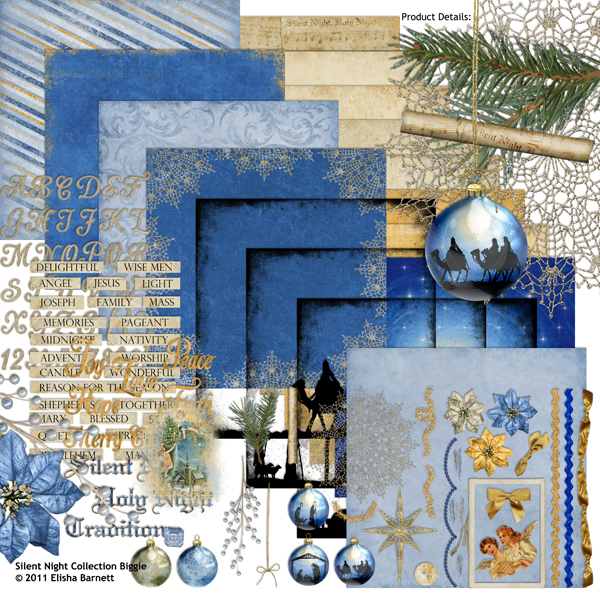 This Value Pack includes 3 products to help you decorate your holiday pages and more. Love, love, love this collection. The blues and golds in this kit are wonderful and the paper overlays are gorgeous. 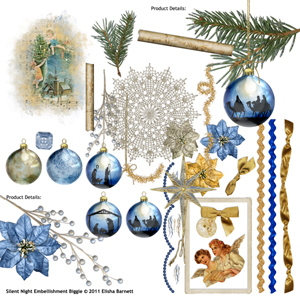 Your Silent Night designs are beautiful and I have them all.